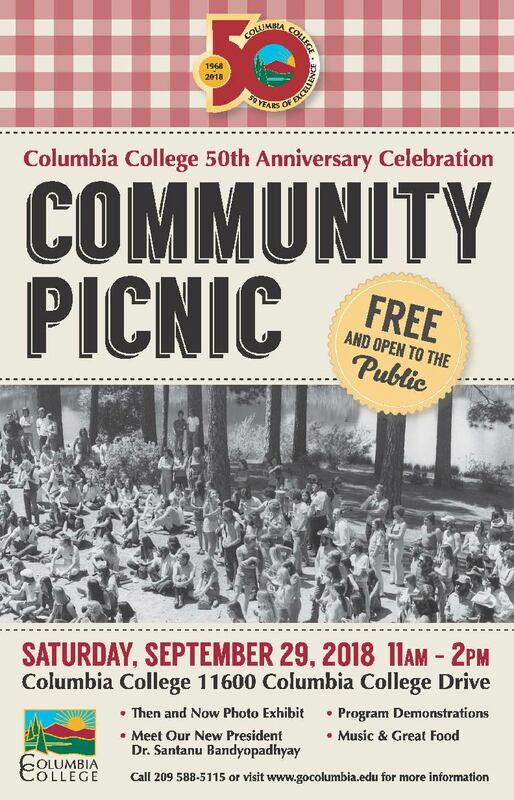 On Saturday, September 29th, from 11 a.m. – 2 p.m., Community members of all ages are invited to a free community picnic in celebration of the College’s 50th Anniversary. This family-friendly event will feature free food, music, campus tours, a “Then & Now” exhibit, and more. Columbia College was established in 1968, in Sonora, CA pursuant to the action by the district electorate to expand the former Modesto Junior College District into the Yosemite Community College District. This created one of the largest community college districts in the state geographically, encompassing 4,000 square miles from San Joaquin Valley and the coast range on the west to the Sierra Nevada on the east. All of Tuolumne and Stanislaus Counties and parts of San Joaquin, Merced, Calaveras and Santa Clara counties come under the service area of the College. The College serves over 4,000 students every semester. The broad range of courses or programs offered by the College cater to diverse needs of the students. Whether one is seeking a degree or vocational certificate, planning to transfer to a four-year institution, improving occupational skills or simply pursuing self-enrichment, there is something for everyone here. For more information about the programs and services, please visit www.gocolumbia.edu. For additional information about the picnic, please call 209.588-5115. This entry was posted in Campus News on September 13, 2018 by Cari Craven.